I had planned to take photos of my Thanksgiving dinner, but only managed to remember in time for dessert. 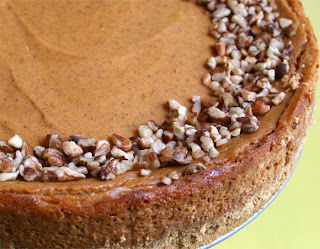 So here is a photo of my Pumpkin Cheesecake. I was originally going to dust the top perimeter with crystallized ginger, but at the last minute decided on chopped pecans instead. It was very yummy, although there was so much food for dinner, we didn’t even want to think of dessert until several hours later. For dinner, I basically made the menu as posted on Vegan.com (you can see a photo of the food there — and all the recipes, too). The seitan roulade has been the centerpiece of our Thanksgiving dinner for over 20 years. I sometimes make a different stuffing for it — this year it was a veganized version of my mother’s chestnut stuffing. It was so good. The roasted sweet potato sticks were a big hit -- I sprinkled them with cranberries and some of the chopped pecans I had left from garnishing the cheesecake. I hope everyone had a very happy vegan Thanksgiving! This picture of my cat Gary hangs on a prominent wall in my house. Whenever I look at it, it makes me smile. 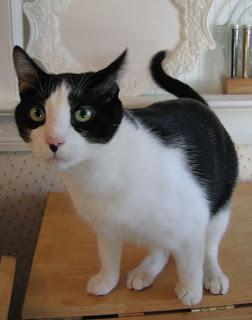 I’ve been trying to come up with a reason to do a blog entry to accompany the photo (other than “isn’t my cat adorable?”). Then Gary himself provided one. My husband and I occasionally take spirulina (blue-green algae) tablets as a supplement. Before I explain what happened, I have to emphasize that Gary doesn’t care about food much. To him, eating his dinner is secondary to cuddling. He is also indifferent to cat treats. But when he caught a whiff of the spirulina the other day, he got wide-eyed, reached up to the table where I’d placed the spirulina tablet (Gary has a long reach), and swiped it onto the floor. Before I could take it away from him, he munched it down like it was the best treat he ever had. I quickly checked online to make sure spirulina is okay for cats, and everything I’ve found indicates that it is. We then offered a half a spirulina tablet to our other cat, Mitzi, so she wouldn’t feel left out. In a split second, she wolfed it down, too, frantically looking around for more. I don’t plan to make a habit of giving it to them until I find out more. Does anybody else out there have a cat who likes spirulina? Am I the only one who can’t believe Thanksgiving is nearly here? If you’ve seen my Thanksgiving recipes on Vegan.com, you know my menu is pretty well set. I always make that seitan roulade, although I do change up the stuffing from year to year. My alternate main dish on the menu is a stuffed squash, which I guess is pretty much everyone’s go-to holiday meal main dish, especially for those who aren’t into seitan. But I don’t need a holiday to stuff a squash. I do it all the time. I usually use buttercups or kabochas (when I can find them) because they have a terrific rich flavor and their shape and size are perfect for stuffing. I adore butternut squash, but there’s not much room for stuffing in their small cavity. 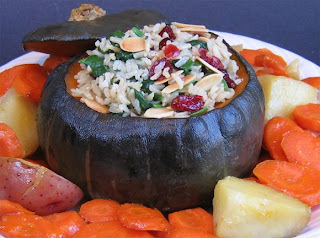 And even though acorn squash are cute, they usually don’t have much flavor. So buttercup it is. So that we don’t end up having “the same old stuffed squash”, I like to keep it interesting with different stuffing combinations. Sometimes I’ll make a traditional bread stuffing with celery and onion spiced with thyme, sage, and parsley. More often, I make a grain-based stuffing, usually with rice, but sometimes with millet, quinoa, or couscous. When I have some already cooked rice or another grain in the refrigerator, the stuffing comes together quickly. To prevent the stuffing from drying out, I roast the squash first until it’s fairly soft (400 degrees F. for 45 minutes to an hour, depending on the size of the squash). Then I stuff it and put it back in the oven for about fifteen minutes, longer if the stuffing is cold. The stuffing in the photo was super easy and quick. In a skillet, I combined sautéed onion, chopped fresh spinach, cooked brown basmati rice, toasted almonds, and dried cranberries. I seasoned it with some sage and salt and pepper. Since the oven was on anyway, I roasted lots of sliced carrots and a few potatoes and dinner was served. Everything was so moist and flavorful, no sauce or gravy was needed. I usually plan my dinner menus a few days in advance, incorporating a mix of family favorites, special requests, and “testers” for my latest cookbook. But once in awhile, usually right around dinnertime, I get a craving for something that’s not on the menu. When it calls for ingredients that aren’t in the house, that’s when I get creative and search the refrigerator and pantry for “do-fer” ingredients. That’s how this “last minute laksa” came into being. I had no rice noodles in the house, but I had a half pound of leftover linguine. I had no lemongrass, but figured the lime would add enough citrus balance to the flavor. No bean sprouts in the fridge, but that didn’t stop me either. Using what was on hand, a steaming pot of fragrant spicy deliciousness was ready to serve within 30 minutes. Not exactly like you’d find it on the streets of Singapore, but so good and satisfying enough to quell those last minute laksa cravings. If you have some bean sprouts and chopped cucumber on hand, they’re good to add to the bowls when you add the cilantro. This recipe makes enough for 2 to 3 large bowls or 4 to 6 smaller bowls of the spicy soup. (If you don’t like too much heat, cut back on the cayenne and chile paste. Heat 1 tablespoon of the oil in a large skillet over medium high heat. Add the tofu and stir-fry until golden brown, about 7 minutes. Season with salt and pepper to taste and set aside. Heat the remaining oil in a large pot over medium heat. Add the onion, cover and cook for 4 minutes to soften. Add the scallions, ginger, curry powder, coriander, and cayenne. Stir in the chile paste and stock and bring to a boil. Reduce heat to medium and simmer for about 15 minutes. 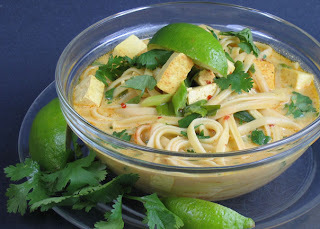 Stir in the coconut milk, cooked linguine, and reserved tofu, and simmer until hot. Taste and adjust the seasonings. The amount of salt you need depends on the saltiness of your broth. To serve, ladle the soup into the bowls and garnish with cilantro and a squeeze of fresh lime juice. 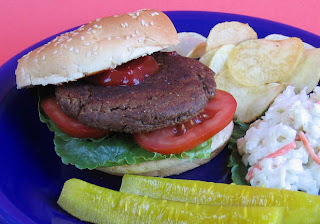 Back in 2002 when I developed the recipe for Ultimate Veggie Burgers in Vegan Planet, my goal was to make a firm-textured patty that looked more like a burger than a veggie. What I came up with was a combination of cooked lentils, ground walnuts, and (most importantly, for the texture) wheat gluten flour. Judging by the volume of positive e-mails I’ve received about it over the years, I’d say the recipe was a success. What I like most about the basic recipe is that it can be modified in a number of ways. Sometimes I leave out the ground flaxseed mixture and they turn out fine. Sometimes I add garlic. Other times I saute the onion (rather than leaving it raw). When I don’t have cooked lentils on hand, I just mash up whatever beans are handy, although the resulting burgers are lighter in color, but still delicious. I’ve even left out the walnuts, opting instead for a little more each of the lentils and wheat gluten. The recipe is very flexible and fun to experiment with. You can also trade in burger rolls for brown gravy and serve them as cutlets. If you’ve somehow missed out on this old standard from Vegan Planet, you might want to given it a try. And if you come up with your own variation, I’d love to hear about it. 1. In a blender combine the flax seeds and soy sauce, blending until viscous. Set aside. 2. In a food processor, pulse the walnuts to coarsely chop. Add the lentils, onion, wheat gluten flour, browning sauce, flax mixture, and salt and pepper to taste. Process until well combined, but with some texture remaining. 3. Shape the mixture into 4 patties, adding a little more wheat gluten flour if the mixture is too wet. Place the burgers on a plate and refrigerate for 20 minutes. 4. Heat the oil in a large skillet over medium heat. Add the burgers and cook until browned on both sides, turning once, about 4 minutes per side.